In the past couple of years, cannabis-inflected skin care has blown up more than any other wellness trend. While it’s becoming more present in the mainstream beauty industry, smaller skin care brands have known about its benefits for years, using it to its full advantage through innovative and unique products. So, we’re giving credit where credit is due—by talking to the brains behind Apothecanna. The skin care brand, which has been around since 2009, believes in the power of the plant. The brand’s passion is evident through its all-natural products, which are sourced and crafted with sustainability and thoughtfulness in mind. Ahead, get to know more about this pioneering brand and its founder James Kennedy. What is your background—what were you doing before founding Apothecanna? With four years at Aveda in product development, I worked on everything from retail to concept design with a focus on consumer packaging. I left Aveda in 2008 for a year of intensive training and mentorship with Aveda’s founder, Horst Rechelbacher, as the creative director of Intelligent Nutrients. The values I learned from [Horst] stay very true to how Apothecanna operates today. Horst was a pioneer of natural beauty, and a visionary plant scientist, and through him I developed a passion for plant-based ingredients and creating conscious, natural products. What lead you to the cannabis space? In 2009, I followed an opportunity to open the first dispensary in Colorado, which had just legalized medical cannabis. I was really motivated to explore cannabis as an ingredient, because we had access to the compounds in a way that was unprecedented. Using my deeper understanding of the power of plant synergies in skincare, I began to experiment with essential oils and cannabis, honing the extraction process and playing with different delivery methods, from topicals to honey. Working at the dispensary, I was able to hear firsthand what people needed and wanted. I created Apothecanna, the first topicals line in the industry, in 2009. 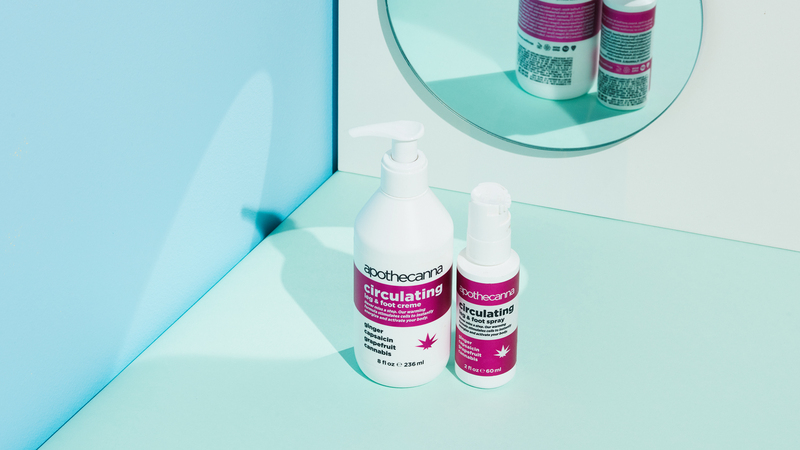 What do you think about the trend of cannabis in skin care? By some standards, we were pioneers in 2009. Cannabis was incredibly risky and not the trendy topic it is now. We’re proud to have been advocating for the plant, its incredible healing properties, and a more holistic, natural approach to beauty and skincare. However, plant-based remedies have been utilized for centuries. Now that we are able to incorporate the latest advancements in technology and chemistry, we can truly harness the power of these remarkable plants. Holistically, our approach encompasses an old-world respect for nature with an understanding of science to treat modern problems. This approach extends beyond what's inside the bottle to how you use it. Our products are meant to enhance daily life by allowing people to get out there and be the best version of themselves. What are some benefits cannabis has over traditional skin care products? Cannabis contains some of the most remarkable compounds in the natural world that are effective for reducing inflammation. Inflammation is often overlooked when it comes to beauty and skincare, but studies have long documented the aging effects it has on our skin, body, and health. Environmental stresses and irritants like sun exposure, allergens, and foreign chemicals cause our immune system to go into overdrive and lead to breakouts, redness, and dryness. Our products have potent anti-inflammatory, antioxidant, and nutritive properties that actually tone down inflammation, resulting in the body healing itself as opposed to masking the symptoms. What’s also exciting about this time and place is the innovation that is happening in the industry—for example, the research around bioavailability with respect to how cannabis and its other compounds are absorbed and its implications for best delivery methods. We’re seeing the science get deeper as there are more trials to reference. This industry is also highly regulated. The regulations in place and testing that is required to stay compliant are so strict that the cannabis industry is emerging as one of the cleanest in the country. We are starting to meet beauty standards that we see in countries like France and Japan with respect to toxins and pesticides in essential oils and ingredients. Cannabis brands are also required to meet a level of transparency that is not required of traditional skin care products. Can you talk a little bit about how you source the ingredients? We have long standing relationships with producers of essential oils that are of the highest possible standards. Each producer we work with adheres to small batch standards, and each ingredient is consciously sourced. From our growers to our customers, our products are touched by hand at every stage of the process. All of our products are made at our headquarters in Denver. It was very important to us to have infrastructure in place to support that. If someone wants to incorporate cannabis into their skin care regimen, where should they start? Incorporating a cannabis product on a daily basis is ideal because our bodies are built to utilize it daily. We have products that range in function from overall wellbeing to pain relief, so listen to your body’s need when thinking about what you’d like to treat. An easy and great place to start is our Lip Buzz! What change in the beauty industry do you hope to inspire through your brand? We hope to speak to a greater cultural trend of wellness and mindful living in which cannabis plays a supportive role. Caring for yourself is so much more than skin deep. We're passionate about pioneering the next level of skincare and designing products that extend beyond just the ingredients you put on your skin but also to how you use it. Our products are function driven (performance based) to help you live a healthy and active lifestyle. In addition to botanical supplements and plant-based beauty products, taking care of oneself, exercising often, eating well—these are all ingredients for a fit mind, healthy body, and beautiful skin. As we see it, cannabis embodies self care, and I believe Apothecanna communicates that sentiment. Our hope is to educate and help people explore what cannabis can do for them—in all its forms. I do my best thinking when I walk, so I walk everywhere, especially when I am in New York—from Central Park to the LES, West Village across the bridge to Brooklyn. I always have a bottle of the Extra Strength Relieving Spray and apply it on my feet, lower back, and neck. It's also really helpful after a late night out. Rub a little on your temples and you feel instant relief. I also love the ritual of our Calming Mind Body Oil. Because I fly between New York, Denver, and Los Angeles, I have to take extra care to stay grounded. I massage it into my temples and on my neck before bed and take a couple deep breaths. All the layered elements of the aromatherapy of the lavender, the physical touch, and the mental relaxation work beautifully together. Our Lip Buzz is absolutely exquisite with mango butter, shea butter, plum kernel oil, ylang ylang, and rosemary. Celebrating our 10 year anniversary! It’s been a long, exciting journey and it's required innovation, creativity, and tenacity to succeed in an industry that is constantly evolving. But through it all, what’s been most rewarding is the truly original work we’ve had the opportunity to explore. We're writing the book as we go, from navigating a tricky regulatory landscape to breaking down social stigmas through conversation and education. We're currently formulating some exciting new products and treatments, and we’re also returning to our roots—we will be releasing our Super Salve in the coming months. It's an original formula of body butter we had launched as one of our first products, in addition to our Relieving category. This is what the company was built on. We’re thrilled to see the growing awareness and explosion of new brands entering the space. We're innovators first and we believe that innovation happens with diversity of thought and talent. More brands help move the conversation forward and normalize cannabis, and we’ll be partnering up to launch some exciting collaborations next year.